Interested in our USBs? Submit your interest below and we'll send one out! I would like to thank you so much for all your help so far. Everybody I have spoken to has been extremely helpful, polite and friendly. I would just like to thank you for your efforts over the last week to get an order put through for me in a week! They arrived Wednesday as promised and look absolutely fabulous! Our year six are going to be so pleased! Thank you again, a brilliant job. Thank you for our leavers' books, which we received in time for the children's last day at school. Very happy with our overall experience whilst creating our Leavers' Book. Staff were very helpful if I needed to contact them for help. The best service I could have received. Thank you for your fantastic help. Sending a PDF of the book really helped me to complete the book in time for my deadline. I will certainly use your service next year! I am writing to thank you for the brilliant service you provided for this school. The book was easy to make up online, I phoned your company only once and the girl could not have been more helpful. Once the order was complete the books were sent very quickly and were perfect. I would have no hesitation in recommending your company to anyone. 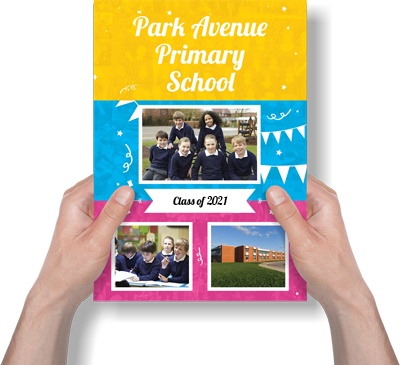 Our Leavers' books have arrived and we are thoroughly delighted with them and for all your help when putting the books together. Thanks again and we look forward to working with your company again next year. Can I just say how much we were impressed with the books, great value and I am sure the children will love them!